Monday marks Chinese New Year with the Year of the Monkey, the ninth animal in the Chinese zodiac cycle. For centuries, people’s fascination with these simian creatures has been documented in both fine and decorative art, often depicting them dressed up and aping human behavior. If you have studied art history you probably know that the term for such scenes is singerie, from the French meaning monkey trick. Monkeys have been used by artists for mocking, mirroring and expressing man’s foibles for centuries. 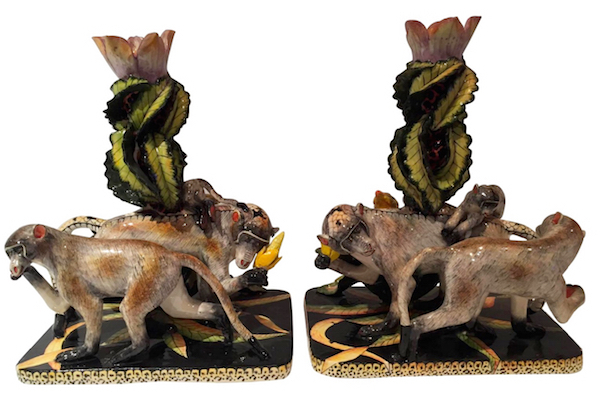 From the Greeks and Egyptians who, in general, held a less than favorable opinion of the creature to the Middle Ages when monkeys were often placed in Eden, symbolizing a human who has given into sin, to the Flemish masters of the 16th century. 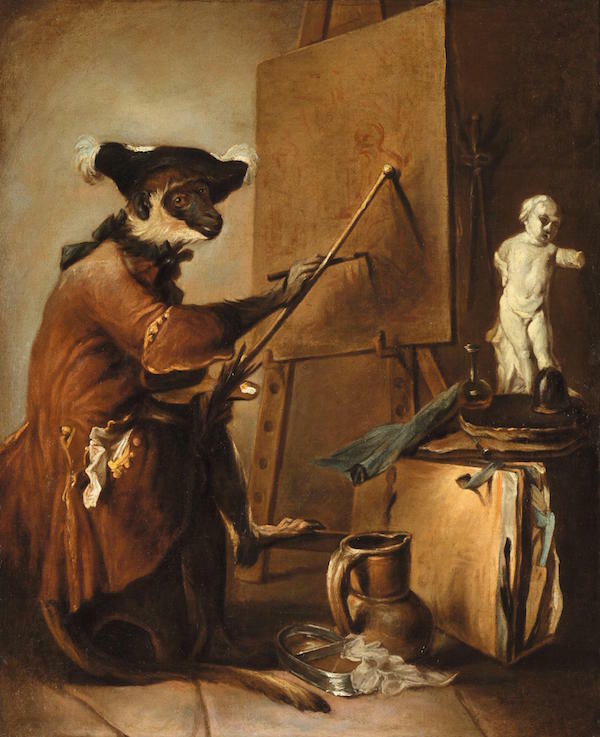 But Singerie per se didn’t come into its own until the 18th century with the work of such French artists as Jean Baptiste Simeon Chardin, with his ironic The Monkey Painter above, as well as the rococo chinoiserie of Watteau and Lancret. 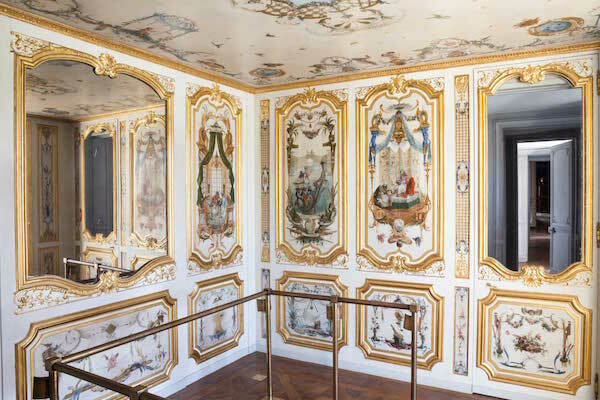 But perhaps the most amazing example is that of Christophe Huet’s Grande Singerie at the Château de Chantilly. 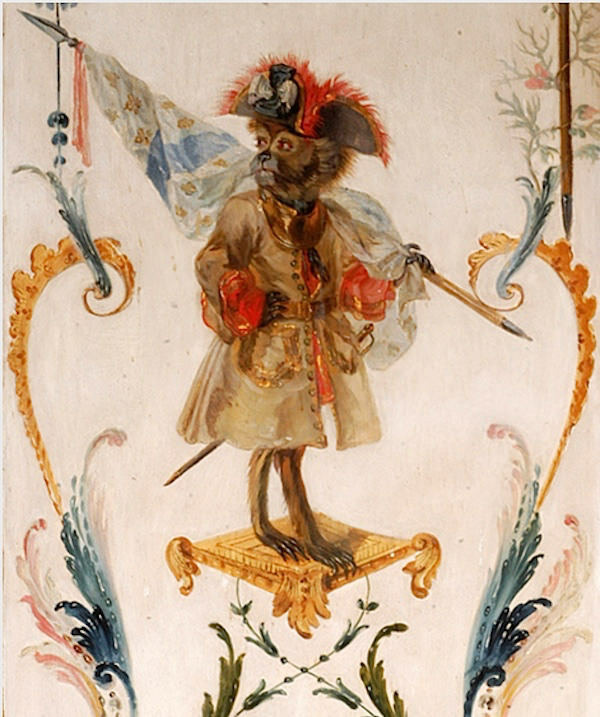 Painted in 1735 for the Duke of Bourbon, Louis-Henri de Condé, the reception rooms at the palace depict allegorical designs of monkeys, in mostly mandarin attire, pursuing activities of everyday life in a satirical manner. 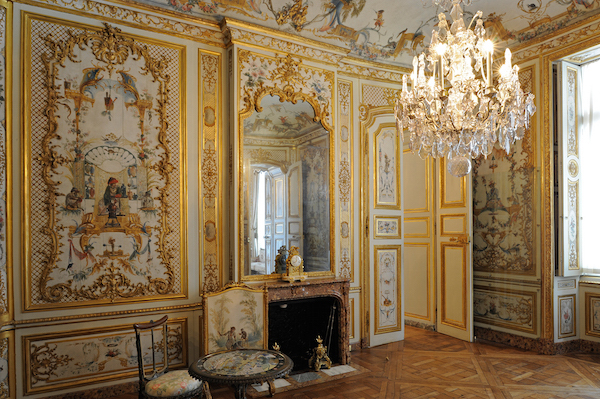 The Institute of France, which owns and manages the chateau through a foundation, finished restoring the room in 2008. The repairs cost $1 million and were possible due the generosity of the Aga Khan, who lived nearby and matched the foundation’s $500,000 to undertake the project. 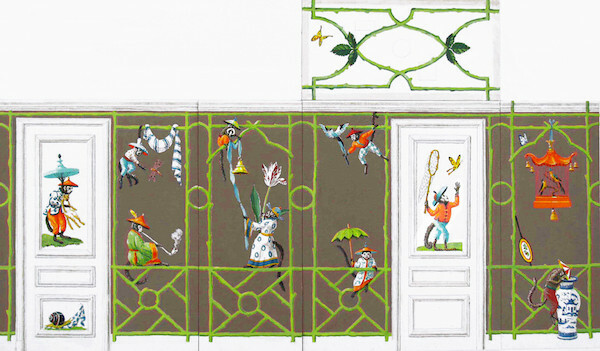 In the private quarters of the château, la Petite Singerie, a room separating the Duke’s and Duchess’ apartments, also features Huet’s decorations with monkeys in more aristocratic rooms and attire. If you are interested in learning more about Huet, there is a book devoted entirely to his work. 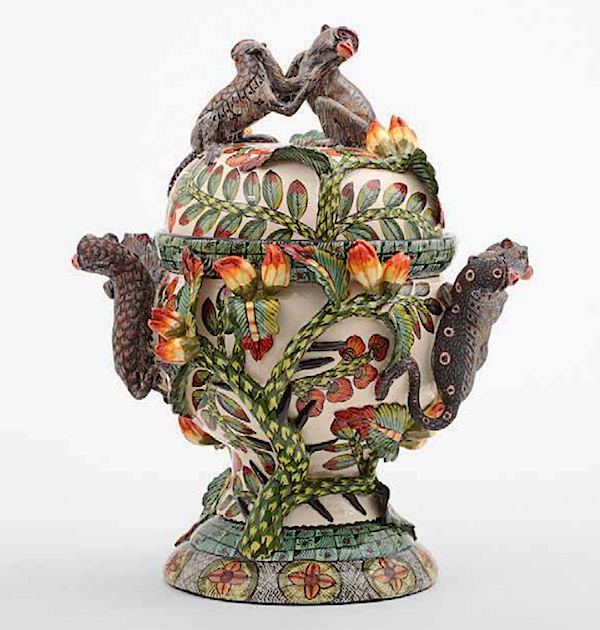 Singerie appeared in other decorative arts as well. 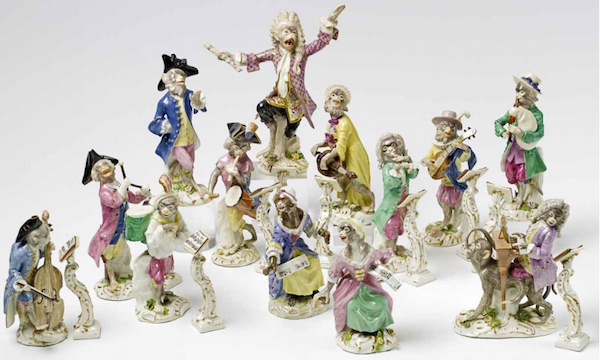 Take for example this fabulous rococo Meissen Monkey Band, ca. 1740. 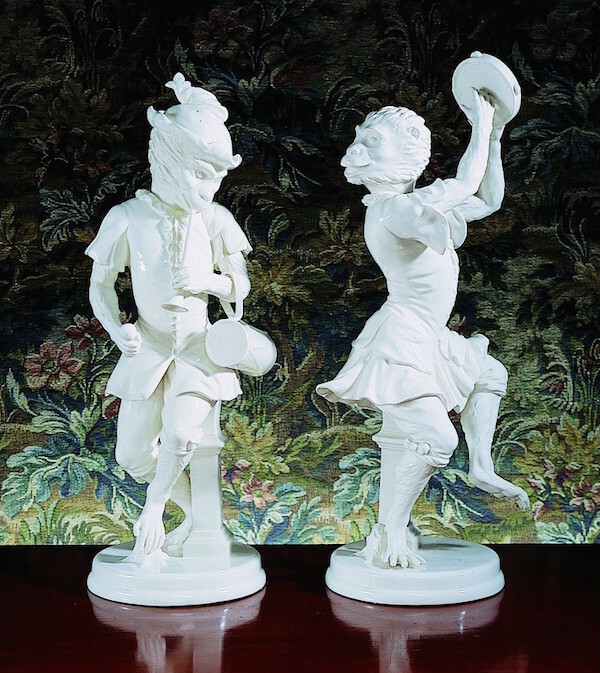 Based on Huet’s illustrations, it includes twenty-two pieces of fashionably attired monkeys made by Johann Joachim Kaendler, the master modeler at Meissen for more than forty years. 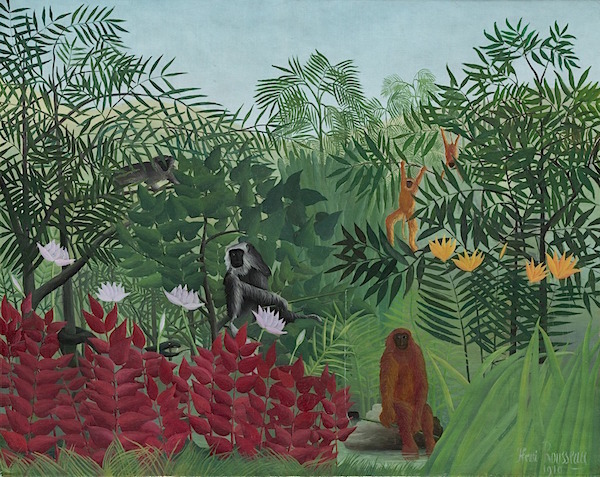 In the 19th and 20th centuries, monkeys are associated with images of paradise where they benefited from a more positive connotation, as seen below in Henri Rousseau’s Tropical Forest with Monkeys. 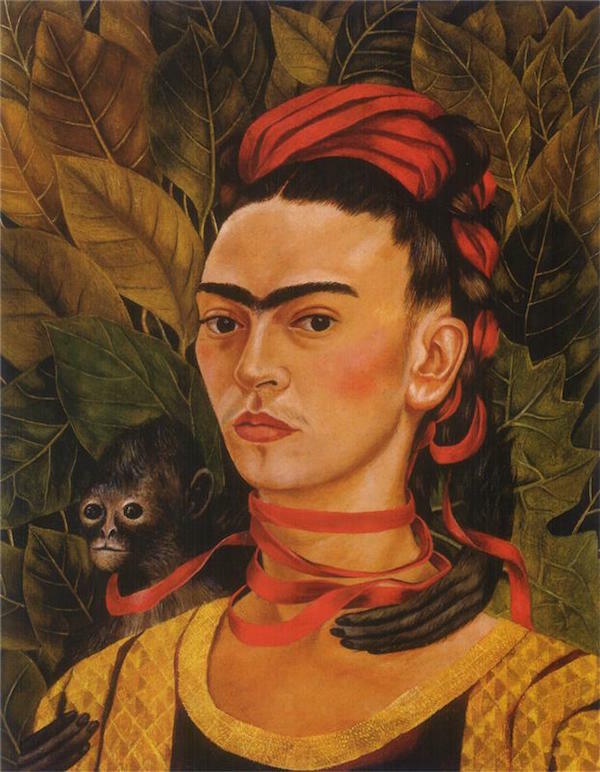 Frida Kahlo’s art depicted monkeys as protective caring creatures. 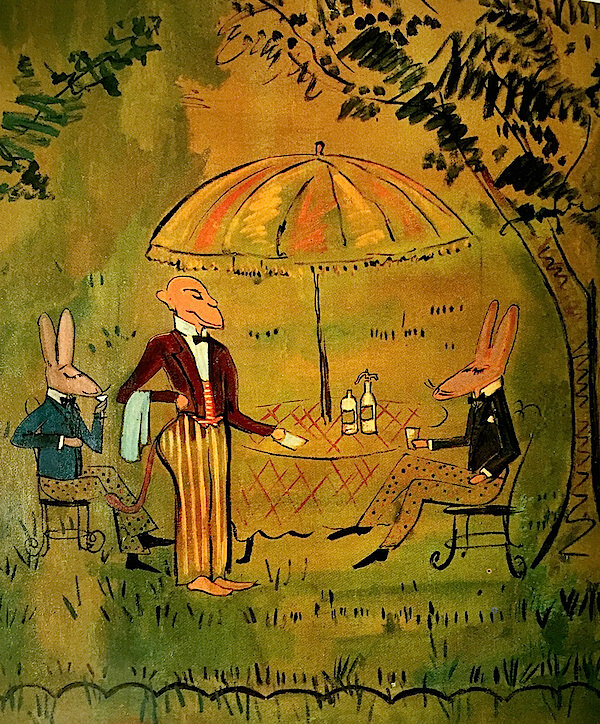 And you can celebrate year of the monkey in posh NYC establishments from the Monkey Bar to the Carlyle where Ludwig Bemelmans’ charming illustrations of Central Park in the bar include a nod to our furry friend of the year. 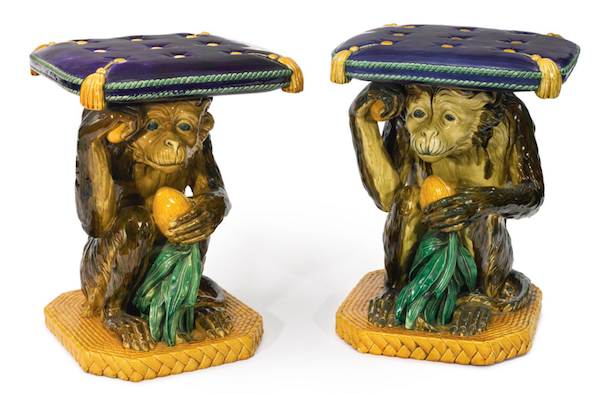 If you have now become a fan of monkeys and singerie, there are many ways you can incorporate them into the more decorative aspects of your life. 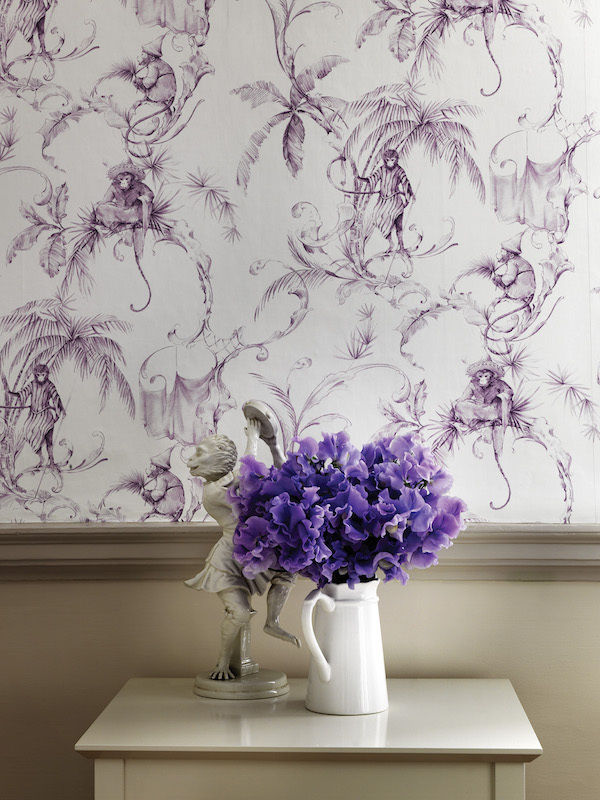 Nina Campbell’s whimsical Barbary wallpaper is named after the tailless Barbary macaques of Gibraltar, the only wild monkeys in Europe. 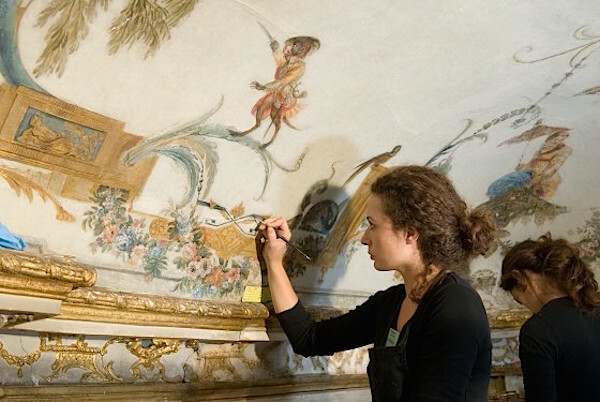 “My interest in monkeys stems from the singerie panels of the 18th century,” she says. “I don’t like horrible, ugly monkeys. I have been well-disposed to monkeys since I was a child, because of Zephir in the Babar the Elephant books – he was quite a sophisticated monkey, he would look after Babar.” Nina always has an amusing answer! Bennison’s Monkey Puzzle is a waggish whimsical treatment, especially zippy in pin and orange on oyster. 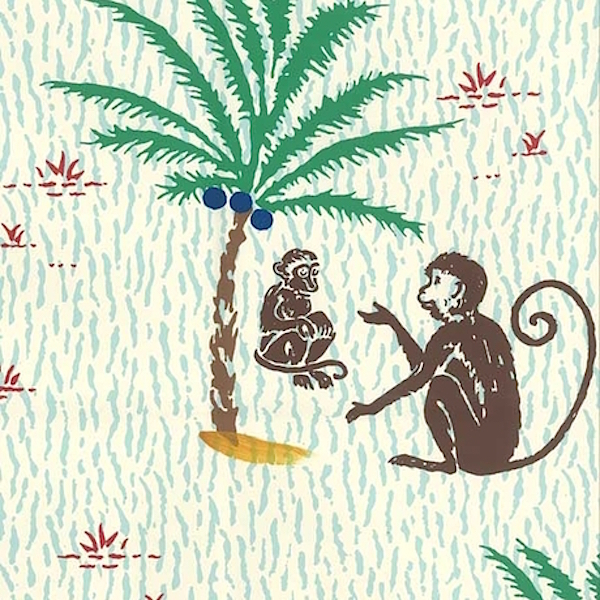 And Peter Fasano’s Monkey Business is utterly charming, in my favorite blue and brown colorway. as is their decorative year of the monkey candlesticks. To learn more about Ardmore and their recent collaboration with Hermès, visit friend Jenny Rose-Innes. 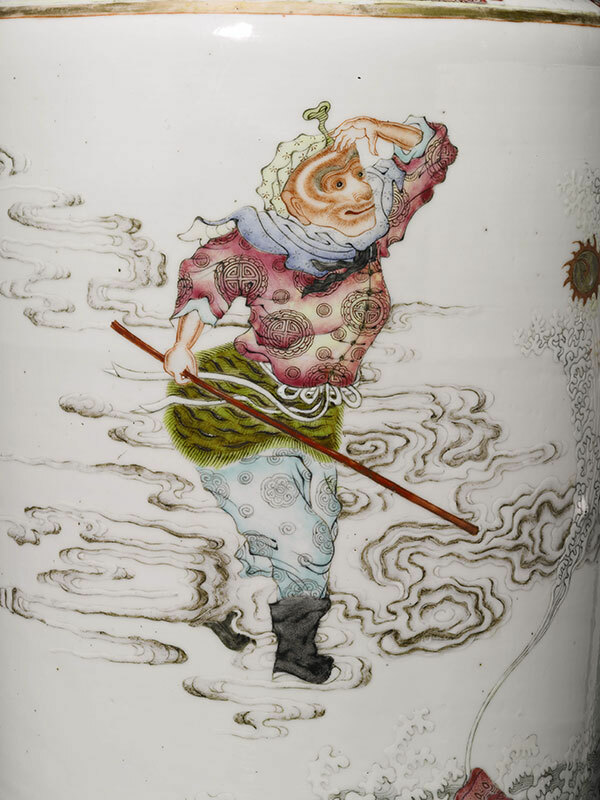 and this Famille-rose Monkey King Vase for $37,500, against an estimate of $6,000 – 8,000 in September 2012. Looking for a little cheeky art? 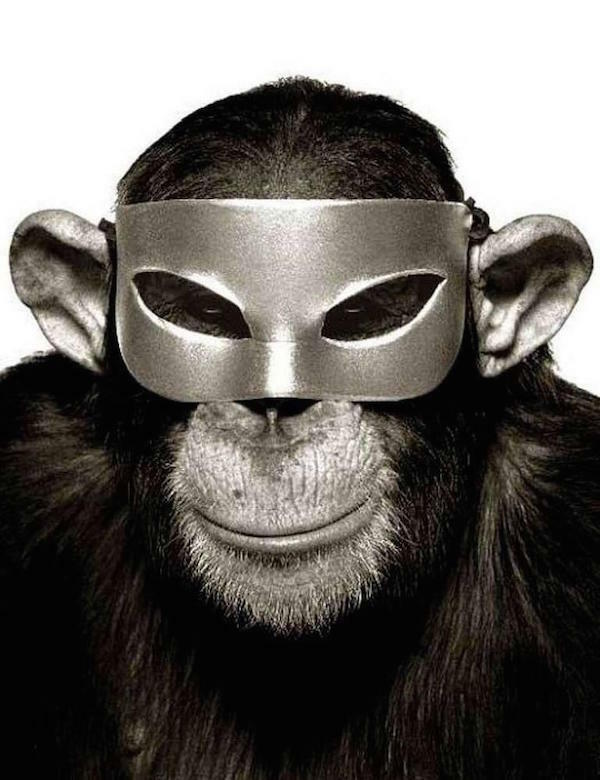 This Albert Watson Monkey with Mask photo would surely be a conversation starter. 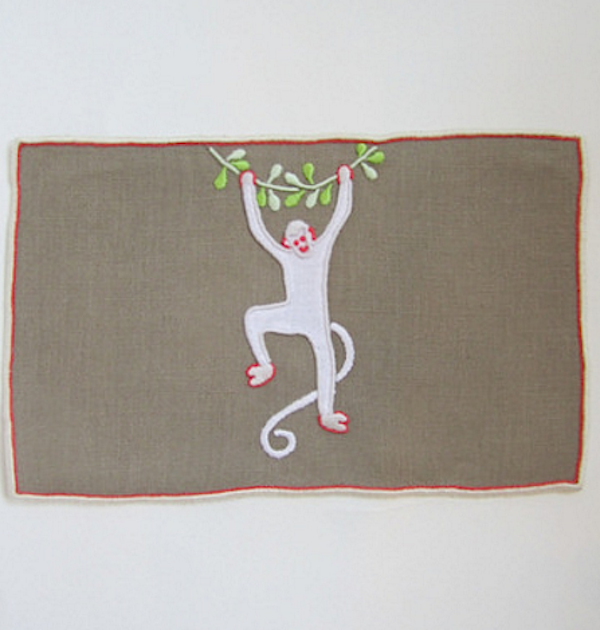 To give cocktails a little simian zip, there are these charming Monkey Cocktail napkins from Sharyn Blond. 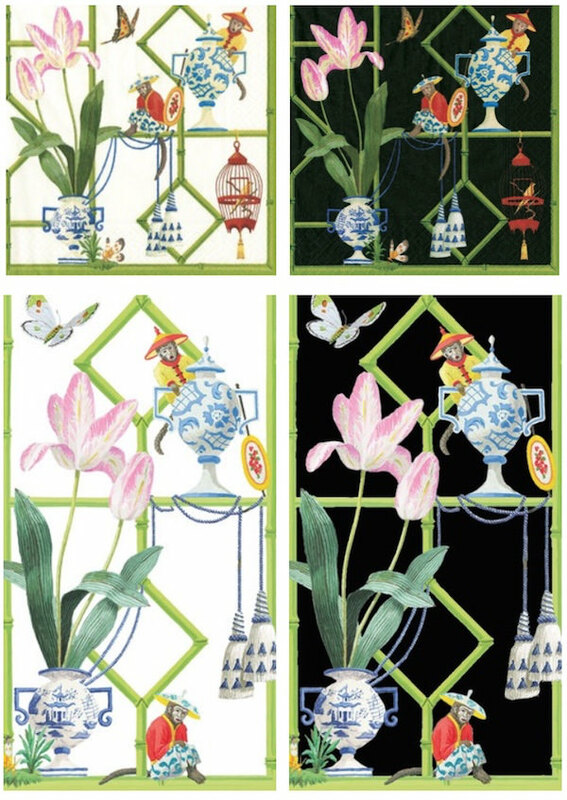 And for those who prefer paper, Harrison Howard‘s chinoiserie Monkey Business suite of products for Caspari is a chinoiserie chic pick. There’s even wrapping paper in a favorite colorway. And for those who want something totally bespoke, Harrison can custom create a singerie scene for your powder room, as seen in in the maquette below. 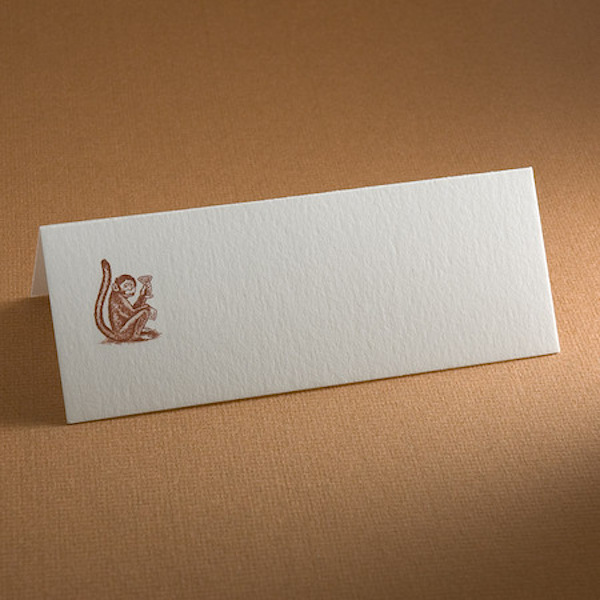 This stylish monkey could make a great signature card, personalized in any variety of colors from The Printery. And their whimsical dark brown gin monkey place card is sure to set the tone for a festive evening. 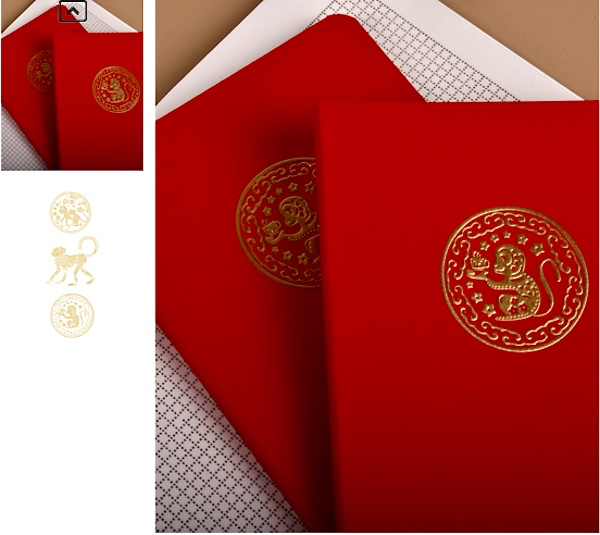 Keep your thoughts organized for the Year of the Monkey with Thornwillow’s set of engraved Monkey Cosmo Journals with three motifs in metallic gold ink. Mottahedeh has a long history of antique reproduction ceramics and decorative accessories. 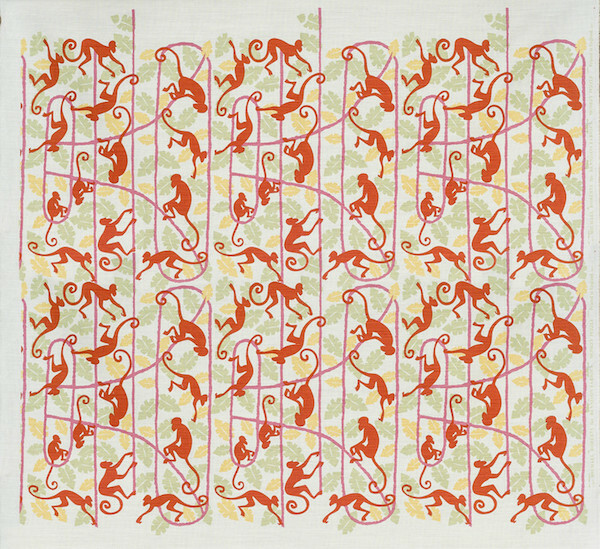 Fitting perfectly within the singerie theme are these spirited Dancing White Monkeys, which you may have spotted in the vignette for Nina Campbell’s wallpaper. If you’re curious how you might incorporate them into your decorative life, take a peek at how Michael Devine integrated them into his fetching table setting for a lilac brunch in his book. 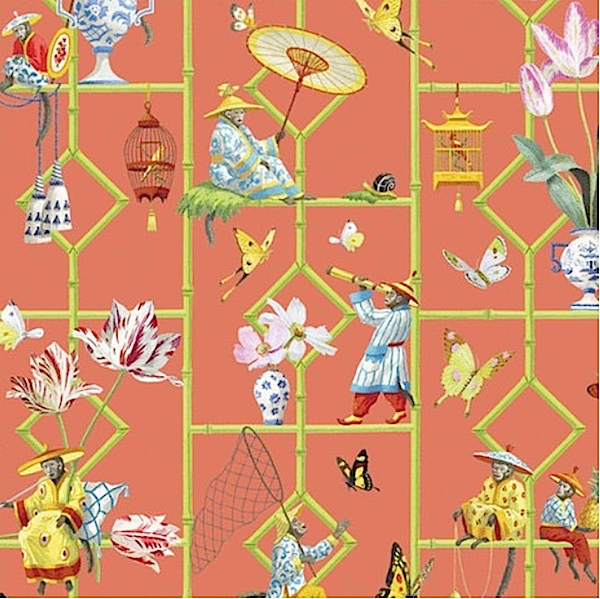 The curtains continue the chinoiserie them with his Garden Folly fabric. 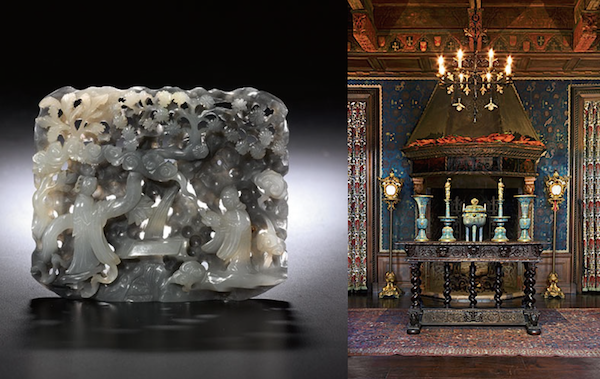 Lastly, to celebrate Year of the Monkey and Asia Week, Sotheby’s will be holding a series of auctions in March and April including two sales of Chinese Art & European Decorative Arts to benefit the Rosen House at Caramoor, the well known performing arts center in Katonah, NY. I will hopefully be back to you with more about the auction and the amazing Rosen House. In the meantime, I wish you all a good start to the new Chinese lunar year celebrating that mischievous yet endearing animal bridging life between the wild and civilized kingdoms. This entry posted in art, auctions, furniture, gifts, history, interior design, Stationery. 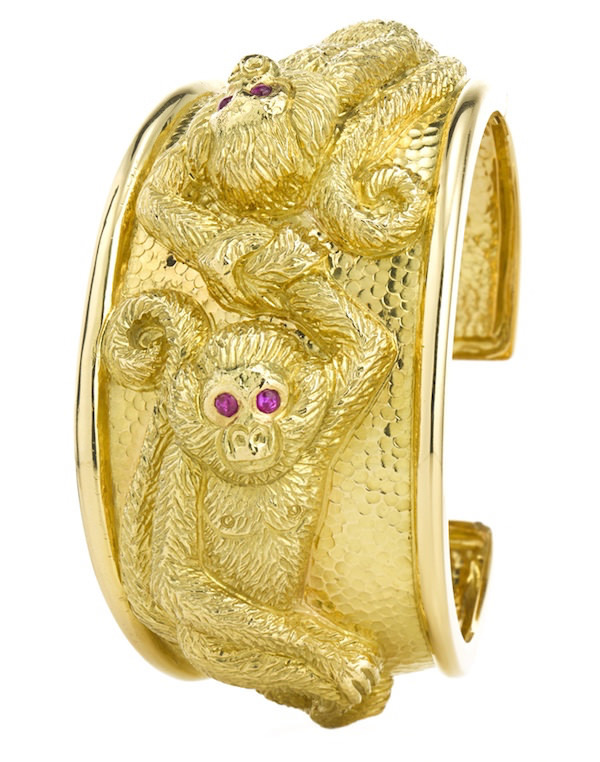 Entry Tags: art, Gifts, monkeys, Singerie, Year of the Monkey Bookmark the permalink. Thank you, really enjoyed your very comprehensive and interesting post regarding the Year Of The Monkey. 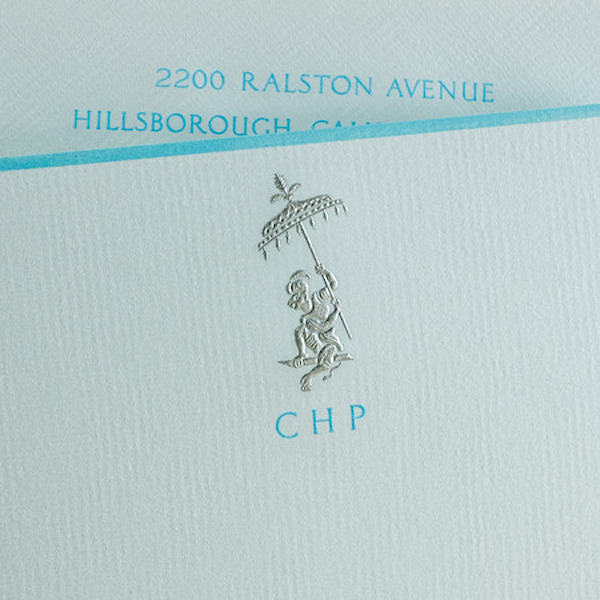 I did not realize so many designers incorporated illustrations of the monkey in their design. Hermes does not surprise me however as China is a huge market for them. What fun! A thoroughly enjoyable read, makes me want to cover and festoon my home with all things Singerie! Stacy, Love Love Love this post. Appreciate all the research you did on those adorable creatures.I adore monkeys and have always been fascinated by them. I have the Christophe Huet book and considered a hand painted Singerie from his book and other photos taken over the years when redoing the walls in my bathroom. The practical side of me (which is rare) took over and I rehung my collection of monkey etchings instead. Thank you for Michaels photo with my three favorite elements…pagodas, monkeys and lilacs. Stacy, Love Love Love this post. Thanks for all of your great research on these adorable creatures. 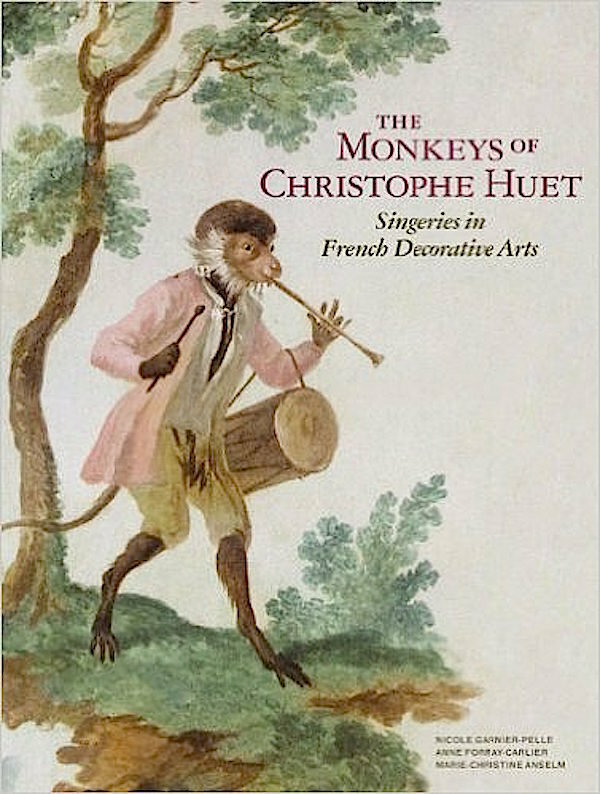 I have a thing for monkeys and also have the Christophe Huet book. Thanks for posting Michael’s photo with my three favorite elements….Pagodas. monkeys and lilacs. What a great post! never met a monkey I didn’t like or a pagoda for that matter. Honored to be a part of it. Thank you for thinking of the collection and the book. Thank you for sharing the different ways monkeys are displayed. Harrison Howard lives in la Jolla, CA and have seen his work first hand. He is a great gentleman. Would love to afford some of his artwork! My friend has a number in her bedroom and are fun and entertaining. Amazing content and photos illustrating the Monkey Year. Fantastic post Stacey! Obviously, I adore monkeys and your post was both a fascinating read and a visual delight! Thank you so much for the mention!